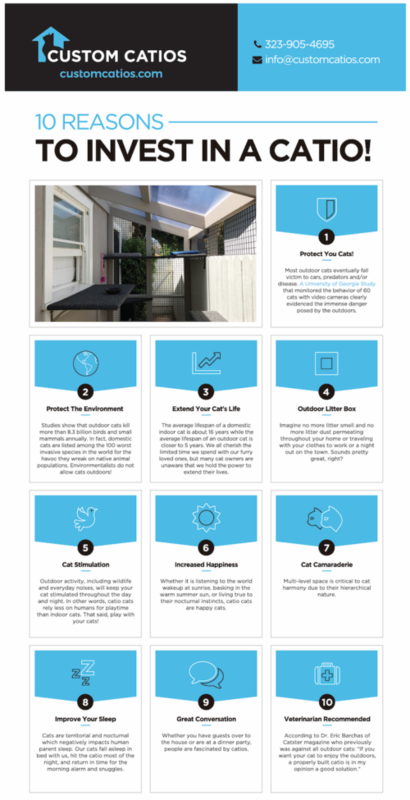 It would be impossible to list all the benefits to investing in a catio, so we compiled a list of the Top 10 Benefits. Let us know if we missed any big ones and we will add them to the list. Protect Your Cats. Most outdoor cats eventually fall victim to cars, predators (coyotes and raccoons), and/or disease. Check out a University of Georgia study that monitored the behavior of 60 cats with video cameras which clearly evidences the immense danger posed by the great outdoors. Protect the Environment. Studies show that outdoor cats kill more than 8.3 billion birds and small animals annually. In fact, domestic cats are listed among the 100 worst invasive species in the world for the havoc they wreak on native animal populations. Environmentalists do not allow their cats outdoors! Extend Your Cat’s Life. The average lifespan of a domestic indoor cat is about 15 to 18 years while the average lifespan of a free roaming outdoor cat is less than 3 years. We all cherish the limited time we spend with our furry loved ones, but many cat owners are unaware that we hold so much power to extend their lives. Outdoor Litter Box. This one is huge for the entire human family. No more litter dust and smell permeating throughout the house and lingering on clothes. Cat Stimulation. Outdoor activity including wildlife and everyday sounds, will keep your cat stimulated throughout the day and night. In other words, catio cats rely less on humans for playtime than indoor cats. NOTE: We still strongly encourage all catio owners to play with their cats! Increased Happiness. Whether listening to the world wakeup at sunrise, basking in the warm summer sun, or living true to their nocturnal instincts, catio cats are happy cats. Cat Camaraderie. Multi-level space is critical to multi-cat home harmony due to their hierarchical nature. Improve Human Sleep. Cats are territorial and nocturnal which often negatively impacts human parent sleep. Feline pets are much less likely to wake up family members in the middle of the night if they have access to the bustling outdoors. Great Conversation. Whether you have guests over to the house or are at a dinner party, your friends and family will want to hear about your catio. Simply put, people are fascinated by catios which, according to Today, are becoming the latest home trend. Veterinarian Recommended. Most vets including Dr. Eric Barchas of Catster and L.A. based Dr. Heather Napolitano agree that catios are a great solution to the many problems associated with letting our feline friends outdoors.